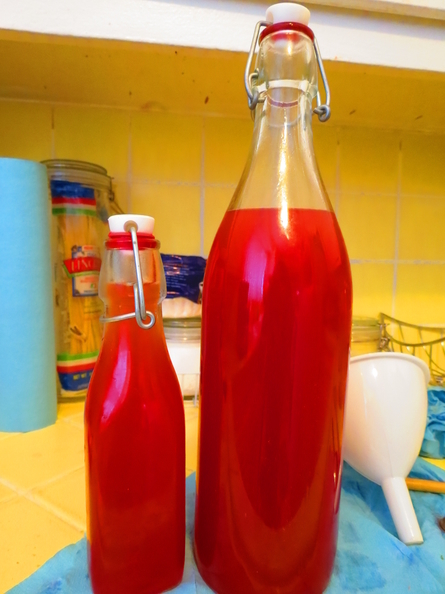 Back in April I started the process of making my own blood orangello (as documented here). This week I finished the process by filtering the vodka mixture and incorporating my homemade blood orange simple syrup into it. The results were better than I had hoped for; well-rounded, sweet, and with a deep color. This is by far the best orangello/limoncello batch that I have made. The use of twice as many blood oranges in the recipe plus saving the juice of all those oranges to make a flavorful simple syrup really took it up a notch. As a reminder, make sure to use organic oranges and super fine organic cane sugar whenever possible– it really makes a difference. Lastly, this particular recipe leaves some of that warming vodka flavor in there– if you’d prefer it to be a little sweeter, just add an extra 1 cup of prepared simple syrup (total 3 cups) to dilute the alcohol further.